We recommend all users to customize their avatar for easier recognition and identification in the system. 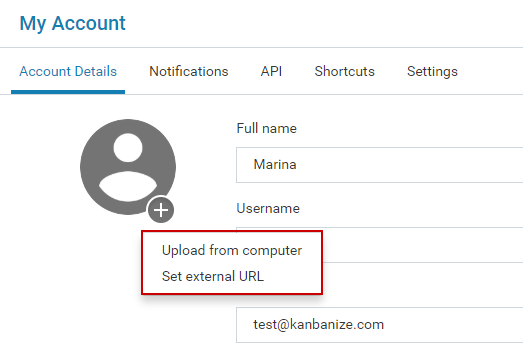 The avatar displays in several places in Kanbanize: on the cards assigned to you; in the Administration panel; in the dropdown list that appears when mentioning a user via the "@" symbol. 1. How to add an avatar? 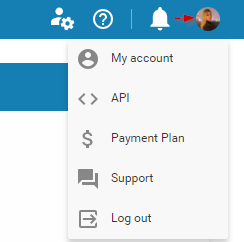 - Go to the upper right side of your board interface and select "My account" to open your Account details. Upload from a computer - select the file from your computer. You will have the option to crop the image. Click on the image and drag a square to select that part you want to make visible. Click on Crop Image and your avatar will be uploaded. Set external link - copy the image address you want to use as an avatar and enter the URL in the dedicated field. Note that the URL needs to be HTTPS. Click on Save and the image will be uploaded. Note: You have to refresh your browser (Ctrl+F5 or Ctrl+R) to see the changes. If you have changed your avatar, but the old image is still displayed (although you have received the system confirmation message “Avatar has been modified”) -> you have to clear your browser cache.